Most online marketers probably know what Fiverr is all about. Fiverr is the $5 marketplace and that’s how it got its name. Online marketers underestimate how this amazing platform can help grow their business. They believe you can’t get something worthy by just spending $5. If Fiverr isn’t that great you will not find service providers earning up to 100,000 reviews on their gig. Yes, there was a gig that has such massive reviews. You definitely know that this kind of service is beneficial to people and that’s why they keep coming back to order. Even recently I’ve ordered a gig with over 1000 active orders, meaning the seller is currently working on these orders. So before you say Fiverr is a waste of money you need to take a look at the reviews the seller has. If you find a seller with at least 100 reviews and with at least 4+ star rating, you definitely know it’s a service you want to order if that’s something that will help you as an online marketer. You can benefit a lot from Fiverr, right from logo design which is an important part of any business, to fixing your website problems or building and setting up a new website, video commercials and much more. The sky is the limit when it comes to using Fiverr. There are a lot of services you don’t know exist on Fiverr unless you visit the categories there. Like I’ve said the key to using Fiverr is to make sure that the seller has some positive reviews. And not only that you should use a gig once before making conclusions on Fiverr services. Fiverr has really changed recently because they’ve upgraded their pricing model. Fiverr is known for their low price services and that’s why everyone loves them. But as a result of this they ended up with a lot of poor quality services. Now at Fiverr sellers can set pricing at their own terms. This means more quality services since a lot of freelancers wanted to work at Fiverr but due to low pricing they couldn’t join or they can’t offer much to buyers. Now you can find sellers offering services at $50, $100, $200 and much more. And you know that these services with reasonable rates offer the best solution to businesses and online marketers. Instead of searching online to find expensive services with fake testimonials why not give Fiverr a try since sellers can’t fake reviews and testimonials. A seller on Fiverr can’t fake 1000’s of positive reviews. By now if you’re the type of online marketer that believes Fiverr services are junk you probably understand it might help your online marketing efforts. The beauty of this website is that you don’t really need to invest a lot from the start. You just need to start small so that you can figure out whether the quality of the service is actually what you’re looking for or not. If things are good you can upgrade with extras. Almost every seller I’ve come across on Fiverr has extras. Extras are like up-sells or I can say an extension of the service you’re buying. Let’s demonstrate with an example. Let’s say you’re ordering logo design for your business. The seller will offer to design the logo for just $5 or $10 on average. But at this price he’ll only send you the image file that’s either PNG or any other image format, but it’s not going to be in editable format. So in order to get the PSD or SVG and other editable file formats you have to order extras. A seller can offer to give you PSD format for an extra $10, or $20 bucks. For gig extras also the seller can also offer to make unlimited revisions until you’re satisfied, unlike when you order the basic gig which will only give you one revision. And we all know that when it comes to graphic design a lot of revisions are needed before the design meet the buyer’s needs. So basically you now understand that Fiverr isn’t just a poor freelancing website. If you’re willing to invest more you’ll definitely get the best services like any other freelancing website out there. This article we’ll be talking about the important Fiverr services which every online marketer need to be using to promote their business online. So far we’ve just show you the benefits of using Fiverr and why you need to use it for your business. But before listing the Fiverr services you need as an online marketer, you need to understand more on how this website work and what makes it different from other freelance websites. We’ll also share some tips that will help you come up with the right Fiverr gig that offer the best services. On your typical freelance website out there you’re hiring a freelancer to work for you, but at Fiverr you’re buying a service. But there are sellers on Fiverr too that offer themselves for hire such data entry or virtual assistants. You’ll find a seller saying “I’ll do data entry for 3 hours for only $10” or “I’ll be your virtual assistant for one hour at $5”. But basically with Fiverr you’re buying a service not hiring a freelancer. Just like any other freelance website out there, you can find a lot of low quality providers. Fiver isn’t an exception; you’ll find a lot of spammers on this website. You can find a seller that promise to place your advert on his 100,000 fans on social media. Later on you’ll find that there is no single active user on his fan page. That’s why it’s important to choose your gigs wisely. One of the best ways to find good gigs on Fiverr is to take advantage of the tools they offer and also trust your instinct. So let’s sort out how find these quality gigs for whatever service you’re looking for. Every time someone orders a gig on Fiverr he is given the option to rate and leave a review for the seller. Sellers can be rated from 1-5 and also can leave a short sentence review. Any seller you want to work with you have make sure they have enough reviews that prove they can deliver what their gig is talking about. You have to be careful though because Fiverr reviews and ratings aren’t standard as other reviews websites like Amazon. On Amazon even 3 start rating is great but on Fiverr you have look for 4.5 out of 5 star rating. On Fiverr most buyers won’t bother to leave a negative review on a service seller even if he did a low quality job. And that’s because $5 or $10 isn’t that much to them. So I can tell you that buyers have this habit of leaving positive reviews even if a gig didn’t deliver to their expectation. So with that said you should look for gigs that have 100’s if not thousands of reviews. But a seller with just 10 reviews even if it’s a 5 star rating all of them, it’s not something you should fall for. When you see few reviews with perfect rating you know it’s something that has been set up. As there are a lot of competitions on Fiverr most sellers from the beginning pay people to come and review their services. One good option that Fiverr offers is sorting reviews by the negative reviews. This means even if the seller has a lot of positive review you can check all the negative reviews at once. This will give you an idea of the negative side of the gig. Whether you’re ordering a logo gig or article writing gig you want to make sure the seller you’re going to choose showcases some samples on the gig page. This will help you know the skill level and quality of the seller. You also have to be careful with this because most sellers have the habit of uploading their best samples. You might see attractive logo or graphic design samples but when you order you get something worse. That’s why it’s always a good idea to try the service once before placing bulk order. All in all you just have to make sure that you view some samples especially when ordering content writing services because on Fiverr most of the writers aren’t native while some use content writing spinners. Imagine someone offering to write 5×500 words articles for just $5. You know they’re push button generated articles. Another important point you might consider even though it’s not necessary but I found that most sellers with video promo on their page provide the best services. With videos you can see this people in action regarding the job they promise to deliver when you order. And the confidence with which they present themselves will tell you they’re good at what they do. When you see a seller with good positive reviews and with a good video presentation on the gig page you know they’re trust worthy. Now we’ve seen how to choose the right gigs on Fiverr, we’ll move on to share some gigs to avoid at all cost, because they won’t help you at all in your online marketing campaigns. If care isn’t taken they’ll do harm to your business. When you see a gig says “I’ll do SEO to rank your website on Google” you know it’s a joke. Even SEO consultants that charge hundreds to thousands of dollars for ranking websites on Google don’t guarantee first page ranking because there are a lot of factors involved like the competition of the keywords and how well your competitor pages are optimized. How could you possibly imagine someone promising first page ranking for $5 or $10! But you might ask why do such gigs have hundreds or thousands of reviews? Nobody orders such gigs for their websites; they’re used on web 2.0 websites. These websites mostly are authority websites and are well established on Google. Even spam links can favor their pages. Online marketers also use such gigs to optimize their YouTube videos and it’s working for them. But under no circumstances you should order these types of gigs on your personal websites and blogs. So how do you know the seller is selling automated Backlinks? When a gig says something like “I’ll build 1000 high PR domain Backlinks” you know that’s definitely auto generated links. Nothing can ruin your website reputation in eyes of search engines other than this kinds of auto generated Backlinks. There are some Backlinks sellers on Fiverr that might be worthy of looking and most of them are manually generated. There are a lot of precautions and factors to consider before buying manual link building on Fiverr. But for the bulk Backlinks that are only five or ten bucks, you know you’re screwing your website. These are also very popular gigs on Fiverr and I wonder why they got lots of reviews. These kinds of gigs are not only deceptive but also spam. You’ll find a lot of gigs promising to submit your press release or article to 100’s of top directories. Not knowing that these directories are created by the sellers or the websites are considered as spam by Google bots. Even the powerful article directories like ezinearticles have lost their shine these days. You can neither get traffic nor build quality links. So stay away from such gigs. This is also another fake service you need to avoid; in fact these services should be banned on Fiverr. It’s funny you find a lot of people on Fiverr claiming “I’ll add 1000 real Facebook or twitter followers to your account”. Another interesting part is it will be done in 24 hours! You know that nothing is real here because he will use a tool consistently to add the same ghost followers to each buyer that orders his gig. If you however just want the number of followers to increase on your social account you can order such kind of gigs but for real engagement you won’t even get a real click to or views to your posts. These are some few services online marketer falls for on Fiverr. There are many funny gigs out there that even your gut can tell you it’s a fake service. So please be aware of them at all cost. Now let’s go on and share some of the best Fiverr services every online marketer need to be using in order to improve their online marketing campaigns. As an online marketer you always need more content. Online marketing is all about content marketing. Fiverr has more than enough when it comes to content writing. You can find writers from any part of this world. For $5 you can have a native writer to put together 200-500 words of unique content for your website. It can be a blog post or press release and the best part is most sellers can deliver this service fast. Remember as a rule of thumb always order one article before placing orders in bulk. Also check reviews first before investing your little $5. Seller’s writing samples can be deceptive. They showcase the best content as sample and can later outsource the task to a poor writer. Mrproofreading is one of the best writers on Fiverr that will give you unique and SEO friendly content for your website or blog. He’s a native English speaker with thousands of reviews. He knows how to hook your customers; this means if you want to people something you can rely on this gig. This is also another great writer that will give you 500 words unique content for your website. He has lots of repeated clients and will give you full copyright on all the content your order. Content is 100% original and pass copyscape, this gig is great because there is unlimited revisions, this means even if you’re not satisfied you can request for some corrections. Every business starts with a logo and it plays an important part in any business. People can forget your business name but hardly forget you logo image. As an online marketer chances are you’re not a good graphic designer, so you want to outsource this task on Fiverr because there 100’s of sellers that can design awesome logo for just $5. If you’re looking for a perfect logo design for your business this is one of the gigs you should check on Fiverr. You’ll get professional logo concepts and you’ll get source files. You’ll get high quality images with transparency. Not only that you’ll get unlimited revisions and your order will be processed fast. When you order this gig you’ll get not one but up to three logo designs so that you can choose the right one that fit your business. And the best part is you get unlimited revisions for all the three logos. You’ll get unique design just like you’ll get when you order one logo. Instead of staying all day trying to create a fancy image for your social media accounts why not outsource it on Fiverr. There are great image editors on Fiverr and also very cheap. This gig is your one stop for all your social media images. For $5 this gig will take care of all your motivational, inspirational, and healthy or whatever quotes you want to be designed. You’ll get high resolution images and your logo or company name can be added all the time. This is one of the best gigs when it comes to social media images. This is the second best gig for social media images. You get designed animated gif banners, backgrounds or any web related website design with this gig. The basic gig also starts at $5. He can design your Facebook, Twitter or YouTube covers with your logo on it. Who doesn’t want to monetize their website for more revenue? The best way to monetize your website traffic is by placing banner ads. Creating a banner by yourself will consume a lot of your time. It’s time to use Fiverr and get an expert create that attractive banner for you. If you want generate clicks and sales from your ads, you should definitely try out this gig. This gig comes with unique approach and design in order to capture prospect’s attention. You’ll get beautiful banners for your blogs, landing pages and social media ads. This is another perfect gig that gives you professional graphic banner ads for use in your online marketing channels. He’s a top rated seller from UK and has over 10 years of experience when it comes to graphic design. Check the gig to see what they can deliver to you; I am sure you won’t get disappointed. This is also one of the popular services offered on Fiverr. This service has its own sub category. You’ll find different accents that are willing to create a video on your behalf without spending much. For as low as $10 you find a spokesperson for up to 1 or 2 minutes. Whatever product or service you have you can find someone on Fiverr that will speak your message. Are you looking for the perfect video commercial? If yes, this gig is for you. This is a great gig for those that want someone to speak their message out. You can provide the background you want and the images you want to be added to the video. Remove any guess work and order this gig now for all your video commercials. This is another good spokesperson that’s easy to work with. If you’re looking for someone that’s professionally dressed you should give this gig a try. Just get your script ready and order this gig, you’ll be glad you did. We all know that whiteboard videos sell like hot cakes these days. A lot of online marketers have seen increase in conversion by adding whiteboard videos on their sales and landing pages. It’s time to take advantage of the cheap services on Fiverr that are offering whiteboard videos. Get the best whiteboard animation videos for your business. This guy has a unique gig for video animations and you’ll get a fast turnaround. You’ll provide a written script and special instructions. And also the logo or the voice you want for the videos. This is another excellent gig for creating attention grabbing videos. You can go ahead and check the samples on his gallery and you’ll understand this is the right gig for video animation. If you’re not satisfied you can request for revisions, so you have nothing to lose. This is another time consuming task every online marketer should outsource on Fiverr. Any repetitive task need to be outsourced if you really want to maximize your online income. At cheap rates you can find sellers that are willing to upload content with images and whatever instructions you might have. Instead of staying all day posting content on your wordpress blog why not allow this gig do the job for you! Not only on wordpress, you can as well order this gig if you want to post content on any website. He can also proofread and edit your content before publishing so as to ensure error free content on your website or blog. If you want your content to be submitted on your blog through various online channels you can count on this gig. Supply your articles or press release and it will be submitted to you desired websites. Are you having a lot of WordPress problems that take you hours or you have to visit the wordpress forum and wait days before you get answers to your problems. WordPress problems arise especially if you using a lot of scripts and plug-ins on your blog. A lot of sellers on Fiverr can fix most of the common wordpress problems for only $5. If your wordpress start showing you error messages or you failed to install plugins, head over to Fiverr and get it fixed. With this gig you can fix anything regarding your wordpress, like installing wordpress, data base connection error and internal serve error, just to name a few. You should contact the seller so that you know what package to order because there multiple packages. This is also another wordpress pro on Fiverr that can handle all your wordpress problems within short time. This gig doesn’t stop at fixing wordpress error messages, he can also customize your CSS and PHP files and can also design a new wordpress for you. You can definitely give this gig a shot for your wordpress customization needs. As an online marketer you sometimes want to add multiple data on a website or maybe you want to extract the data from another website. Fiverr has a lot of cheap data entry experts. You’ll find sellers that are willing to do data entry for up to 3 hours at just $5. Outsourcing data entry tasks is a real time saver for online marketers. Think of any data entry job and this gig can do it for you. This include web research, data entry, data mining, word/excel typing, wordpress data entry and just anything else that comes in your mind can be outsourced with this gig. The seller has a proven track of record. So this means there is nothing to be afraid of before ordering this gig. The basic gig order is for up to 4 hours of data entry work. Make sure to discuss with the seller on the nature of the job before placing your order. For online marketers research never ends. And this is the best gig to handle research and data entry task. If you want to scrape data from multiple websites you need to try out this gig. They’re one of the best Fiverr gigs for the job. At some point you’ll always want to edit your graphics, from your business logo to eBook covers or banners. There are Photoshop experts on Fiverr and can do whatever Photoshop edits you want. Instead of wasting a lot of hours trying to make simple edits to your graphics, it’s better to outsource the task for only $5. With over 10,000 reviews and five star rating you know this is a gig to count on when it comes Photoshop retouching. Order this gig for any image editing task. Price starts from only $5 but you do have to contact seller for the appropriate pricing of your edits. Order this gig for any image retouching you want such as changing background of an image, whitening teeth of pictures, retouching the skin and much more. This is another great service for retouching images. If you’re looking to add different materials to your images you should check this gig. Bob has more than 20 years of experience and he’s on Fiverr to offer his services at affordable rates starting from $5 only. One of the important components of any video is its thumbnail. When it comes to YouTube your thumbnail is what separates you from your competitors. You have to creative to come up with the right YouTube thumbnail. On Fiverr you’ll find a lot of gigs offering this service and you’ll benefit a lot as an online marketer. This gig has served a lot of powerful YouTubers when it comes to creating attention grabbing thumbnails. The success of your videos hugely depends on thumbnails and that’s something you don’t want to mess with. Order this gig to get the best quality thumbnails for your videos. You’ll get different formats for your images like Ai, PSD and more. If you’re looking for the best thumbnail you won’t regret ordering this gig. This seller took the challenge to create 3 professional and high quality thumbnails for your videos. He has five star rating and thousands of positive reviews. With so many years of experience in graphic designs you’ll get the best thumbnails quickly and easily. Order and you won’t get disappointed. If you have eBooks or you’re just offering free report on your website you need an eBook cover. Coming up with the right eBook cover can be time consuming. You’ll find the best e-cover designers on Fiverr starting at just $5. Having over 16,000 reviews, this seller has proven to be one of the best eBook cover designers on Fiverr. Very creative and has access to over 50 million stock photos to design your eBook cover the way you want. For the basic gig the seller offers, you’ll get a 3d mockup and will get unlimited revisions until you’re satisfied. You definitely need this gig for your eBook cover designs. This is also another good seller on Fiverr with a good track of record. Having over 18 years experience in the field, you know it’s someone that knows what they’re doing. With this gig you’ll get awesome covers and comes with unlimited revisions in case you’re not satisfied. Even if you’re going to record all your videos with camera you’ll need professional intro and Outros for your videos and Fiverr is your best friend when it comes to creating these intros and Outros. As you might already know you only have a few seconds to hook your visitors on your videos. The first step is having a smart intro to your videos. This gig is meant to design professional intros and outros for your videos with ease and without spending much out of your pocket. Whatever ideas you might have, let them out and the seller will design a modern and professional intros and outros for your videos. This is another full time graphic designer that will design cool and eye-catching intros for your videos. You have the option to choose your custom colors until you’re 100% satisfied. You can have your logo or whatever image you want to be added to the videos. This gig is one of the best animation services on Fiverr. This is also another time consuming task. Most people might consider using rev.com, but Fiverr is a lot cheaper. So if you have hundreds of hours of audio files that need to be transcribed you should head over to fiver to find the best gig in that category. For only $5 this seller will transcribe up to 8 minutes of your audio or video files. Order this gig to transcribe YouTube videos, interviews, podcasts and anything you just want to transcribe. Why spend hours when someone can do it cheap. The seller has more than 20 years of experience in this field; you don’t need to worry about quality. This is another good seller on Fiverr when it comes to transcription. The seller has more than 2000 happy customers and has transcribed thousands of hours of transcription. This gig can transcribe whatever you have and bring it back to you fast. And finally we’re closing the list with keyword research. Keyword research is important for any online campaign. There are a lot of Fiverr sellers that can do this job perfectly. You just provide your seed keyword and they’ll give you a list of profitable keywords that will help you drive more traffic to your website. Want to get the best keywords that are easier to rank? This gig is all you need. Stop wasting time using keywords that are difficult to rank. Order this and get the most profitable keywords ideas that will bring in more traffic to your website. With thousands of positive reviews this seller will give you a list of 200 best keywords for your online marketing campaigns. You can specify your country or URL you want the keywords ideas to be generated from. You’ll get in-depth information like traffic estimate, SEO competition, PPC competition and the level of difficulty. 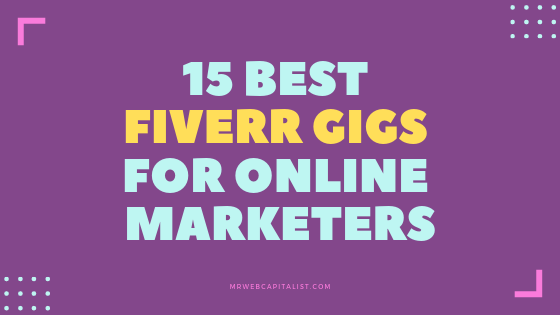 There are a lot of gigs online marketers can benefit from when it comes to using Fiverr. You just have to be careful and make sure that any gig you choose doesn’t hurt your online marketing campaigns. If you’re into link-building, then check out 15 Best Link Building services to buy on Fiverr and read about if Guest Posts are safe to buy on Fiverr.